A family in Parker decided to try a new tradition this Christmas of opening up their home to complete strangers. 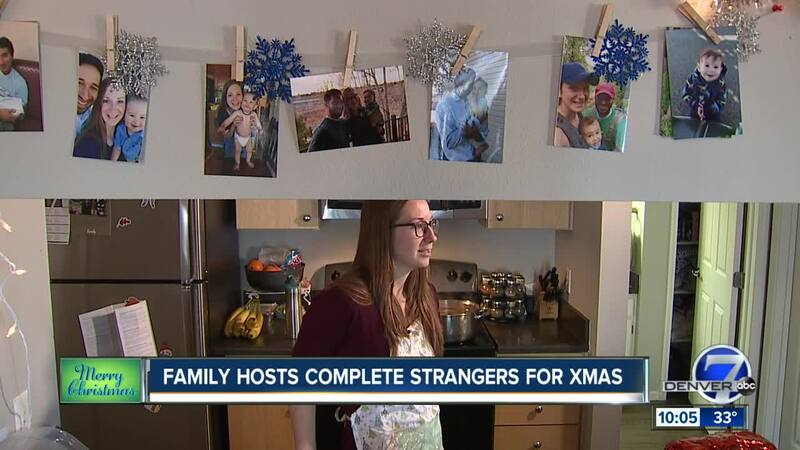 PARKER, Colo. — A family in Parker decided to try a new tradition this Christmas of opening up their home to complete strangers. Emily Infante and her husband Oscar posted a message this week on Facebook offering to cook Christmas dinner for a few people who don’t have a place to spend the holidays. This is the couple’s first Christmas in Colorado. They moved here in July after Oscar Infante was offered a job in town with Volkswagen. The two said they were drawn to the outdoors and loved the feel of the area, even if it is hundreds of miles away from both of their families. Emily said she told her husband about the idea and they decided it was the best way they could spread a little holiday cheer since they’re not with their own families. The post quickly earned hundreds of likes and numerous comments from people thanking the couple for their generosity. It even helped connect the couple to their new Colorado community in unexpected ways. “One lady actually must have got into my profile and saw that I was from Idaho and we actually discovered that her sister or sister-in-law is related to somebody I graduated with," Emily Infante said. "That was funny. It’s a small world." The couple is part of the Church of Jesus Christ of Latter-Day Saints and said their religion inspired them to try to give back to others. They aren’t sure whether anyone will actually take them up on their offer, though some have written. However, even if the couple spends Christmas alone, they’re teaching their 1-year-old son about generosity, love and selflessness. “We just always help someone else because you never know when you’re going to need help,” Oscar said. If the couple spends Christmas away from their families next year, they say they plan on doing the same thing.